Could Good Burger 2 actually be happening? 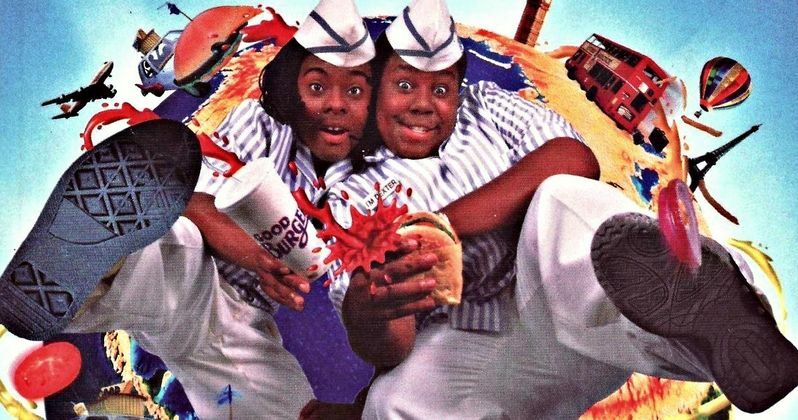 Kenan Thompson and Kel Mitchell optimized 90s Nickelodeon with Good Burger when it was released in 1997. The movie may not have been a hit with critics, but plenty of 90s kids hold a special place in their hearts for Good Burger and, more than 20 years later, quite a few people want to see a sequel happen. Including Kel Mitchell, who reveals in a recent interview that the sequel may actually be happening and conversations are taking place. Kel Mitchell recently answered fan questions for BuzzFeed. The interview covered a range of subjects, but inevitably, the topic of Good Burger and a possible sequel came up. Somewhat surprisingly, Mitchell revealed that actual conversations about just such a thing have started recently and that there's "something in the water." Here's what he had to say about it. "The conversations have started. There's something in the water, everything's coming back. It will definitely be awesome and there was a meeting! They're just working everything out contractually, so just keep your ears to the streets." Who is they? Is Nickelodeon planning on bringing back Kenan Thompson and Kel Mitchell for Good Burger 2? At this point, it's very unclear, but this isn't the first we've heard of such a project and it looks like someone has been paying attention. Someone who can actually make the movie happen. Thompson has kept busy with Saturday Night Live over the years, but in a podcast interview from last year, Mitchell revealed that the pair have talked about it and that it might be a Bad Boys-style sequel, whatever that may mean. The pair initially rose to fame as stars of Nickelodeon's All That. That's where the Good Burger sketch originated, which the network made into a movie in 1997. The pair also starred in their own show, Kenan and Kel, aside from the movie and the kid-friendly sketch show. The movie has gained a cult following from 90s Nickelodeon loyalists, so there's certainly a market for something like that. Though no movie was ever made, Good Burger did get a sequel in 1998 in the form of a book. Good Burger 2 Go sees Ed's secret sauce being sold without a license. In order to save it, the sauce must be approved via a taste test. Not the most thrilling plot on paper, which may be why it was never adapted into a movie sequel. The new story was written by Dan Schneider and published by Steve Holland, who both worked on the original movie, as well as overseeing a number of Nickelodeon shows over the years. It hit book stores in 1998, a year after the original movie. Nickelodeon has had success with recent efforts like Hey Arnold: The Jungle Movie, with a Rocko's Modern Life movie on the way as well. Could they revive the duo of Kenan and Kel for Good Burger 2 in the near future? Fans went so far as to start a petition to see it happen last year. Who knows? Maybe a streaming service sees the value in a Good Burger sequel and is working something out. In any case, it sounds like this could be more than just a 90s kid pipe dream in the near future. You can check out Kel Mitchell's full interview, courtesy of the BuzzFeed Celeb YouTube channel, for yourself below.